If you live in San Francisco, expect to see more of those bright orange electric bikes on the road in the coming weeks. 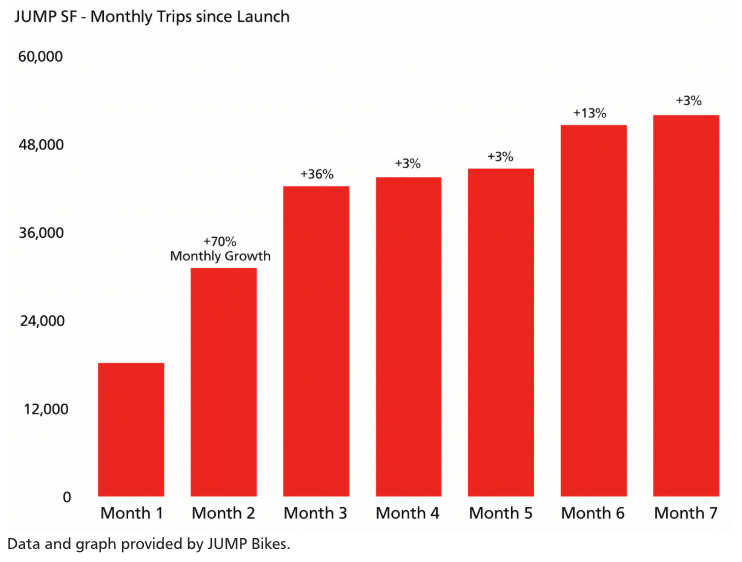 JUMP, the Uber-owned electric bike-share service that is about halfway through its 18-month bike-share pilot in San Francisco, may deploy an additional 250 bikes in the city. The pilot initially enabled JUMP to deploy 250 bikes with the potential to deploy an additional 250, if the first nine months went well. Next week, the San Francisco Municipal Transportation Agency Director of Transportation is expected to make a formal decision around the expansion. Though, the SFMTA staff is recommending the city allow JUMP to deploy another 250 bikes. Update 10/11: The SFMTA made it official and has allowed JUMP to operate up to 500 bikes in the city. 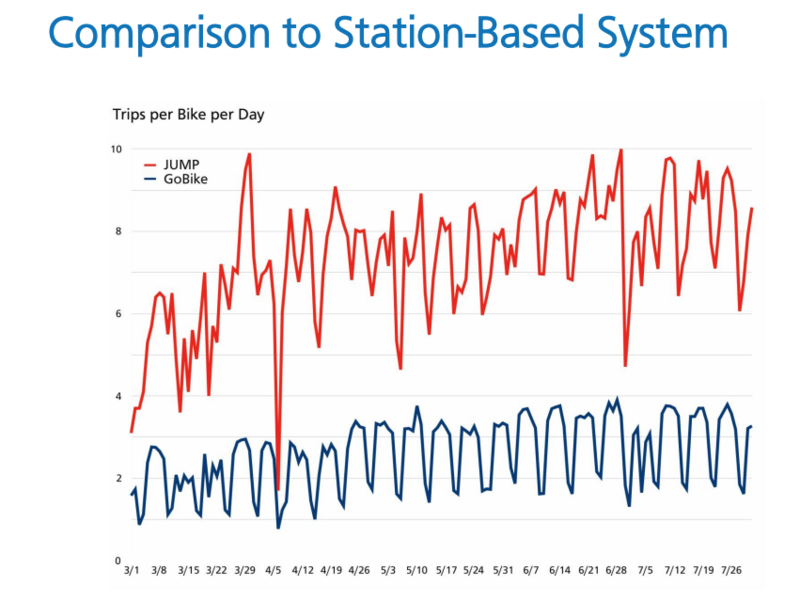 Since deploying the bikes in January, JUMP has clocked more than 326,000 total trips across 38,000 unique riders, with about 2,250 trips taken each weekday. Meanwhile, the average JUMP bike gets used between eight to 10 times a day, with an average trip length of 2.6 miles. JUMP bikes operate in tandem with Motivate’s Ford GoBike system, which includes both regular pedal and pedal-assist bikes. Based on the SFMTA’s preliminary conclusions, there is high demand for shared, electric bikes. Also, they seem to serve different trip lengths, origins and destinations, according to the SFMTA. In San Francisco, there are 1,200 Ford GoBikes with about 5,500 active riders. Per weekday, there are about 6,000 trips taken. While each JUMP bike makes about eight to 10 trips a day, a single Ford GoBike makes about one to four. Below, you can see just how much more popular JUMP’s shared, dockless electric bikes are than the shared, station-based bikes from Ford GoBike.